Diplomático Rum is a product of La Miel, Venezula, produced by Destilerías Unidas S.A. and is, "...the most awarded premium rum in the world." It is amber in color. The nose is layered with hints of sugar, orange zest and anise. It has a sweet taste with a smooth finish. 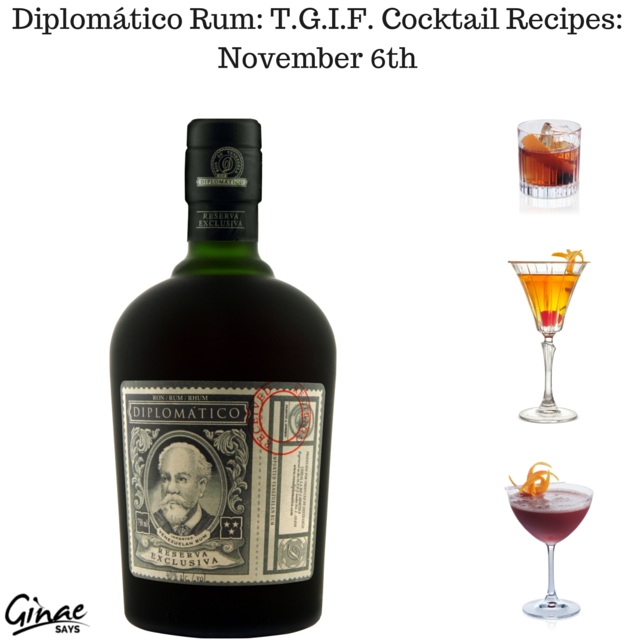 The rums of Diplomático are made from sugar cane, molasses and honeys (with a high concentration of sugar). It is imported by Domaine Select Wine Estates with national availability. It is favored by rum drinkers everywhere, the world over. Combine Reserva Exclusiva, sugar syrup, Angostura bitters and orange zest in a mixing glass with large ice. Stir vigorously and strain into an old fashion glass over one large ice cube. Garnish with orange zest twist or Maraschino cherry. Fill a mixing glass halfway with ice and add Reserva Exclusiva, Cocchi Vermouth di Torino and chocolate bitters. Stir vigorously for at least 30 seconds, and then strain into a chilled cocktail glass. Add the cherry and garnish with the orange zest twist. Fill a cocktail shaker with ice. Add all of the ingredients and shake vigorously. Strain and serve in a chilled cocktail glass. Garnish with the orange twist. If you'd like to try any of these for yourself, we found it for sale @ Crossroads Wine & Spirits for $21.99 (375ml). Sweet. 'Course, it's much cheaper if you're in Venezuela.